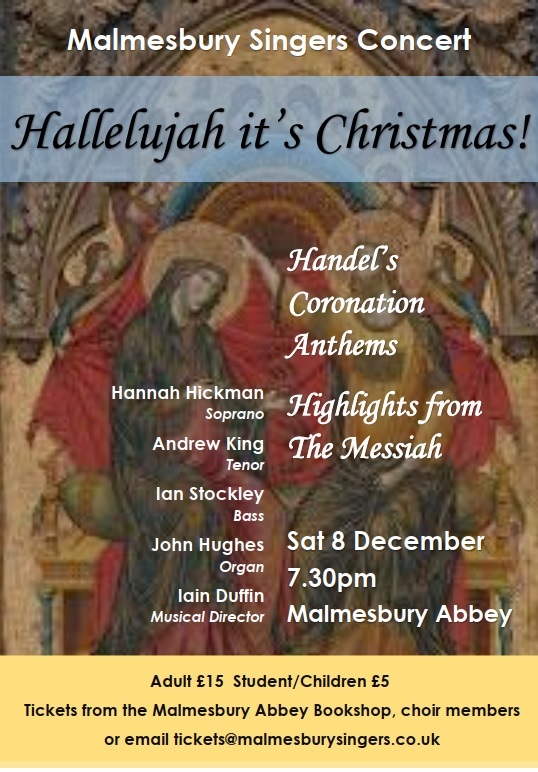 We held our Christmas Concert on Saturday 8th December at 7.30pm in Malmesbury Abbey and the feedback was excellent! A Message from our Conductor: “Our soloists were all impressive and all three I thought brought a little extra magic in the evening. Numerous people in the audience complimented the choir’s diction (“I heard every word” was a comment reported by more than one singer), and said how enjoyable the Coronation Anthems were. 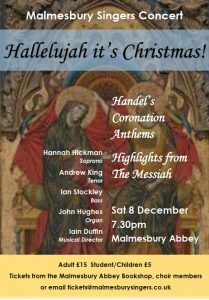 The Messiah choruses, especially “For unto us” and “Hallelujah” fizzed and bounced as Handel should”. Our Retiring Collection was in aid of Prostate Cancer UK. The amount raised from a generous audience was £751.44 which is a superb result. This will help the Charity to spend the funds where best needed. GETTING to concerts – should you require traffic news and updates if you are driving to the concert, please click this link to a travel reporting website. It provides users with the most up-to-date road traffic information. Data is updated every 5 minutes using sensors placed on motorways and common A / B roads.